Frizz, that creepy hair which appears on the top of the head, is a problem present in all types of hair. It can be either new hair that is being born, or it can be broken hair that is short. The reasons that cause the frizz are diverse and many habits adopted by the women end up causing the frizzy hair. If you fit into the group of women who cannot take frizz anymore and want to know how to avoid them, the following article is full of tips and solutions for this problem. Read the story and get rid of the frizz. Whether it is because your hair is damaged or because you are adopting habits that make them appear, there are several reasons that cause frizz. See below the top 10 habits that are the main reasons for frizzy hair. The shape and the way you comb your hair influences the increase in frizz. Wavy, curly or curly hair should be combed only while the hair are wet. Smooth hair should be combed every day, so that the scalp nutrients spread through the rest of the hair. The most suitable is that the hair is combed with wooden objects. Pay attention to how you use the towel after bathing. Twisting the hair or even wiping it on the towel causes the hair to break, resulting in more frizz. Just pressing the hair against the towel already takes away much of the moisture without ruining the hair. Another interesting tip is to use microfiber towels to dry your hair. But if you do not have this type of towel, you can wear an old cotton shirt. Hot water is one of the biggest villains of hair. It causes dryness, leaves the strands more tangled, and increases oil at the root. Drying yarns become more brittle, increasing frizz. Therefore, whenever you wash your head, you may prefer lukewarm or cold water. If it is very cold, the tip is to wash your hair outside the bath, in a tank or in the bathroom sink, and then take a warm shower. To have healthy hair without frizz, to use the dryer in the correct way is fundamental. Always use it with the nozzle so that the jet is directed, avoiding that the hair dusts. Do not forget to apply a thermal protector before use. Before drying the hair, remove the excess water with a towel and leave the dryer at the right temperature for your hair, avoiding to burn them. A jet of cool air after drying helps to make hair look brighter. 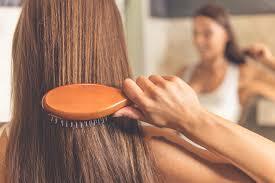 Some women also use a lot of hair straightening devices. I am not saying that you should not use. I am just saying that you should choose your hair straightener wisely. If you have really frizzy hear; read the review of L’Oreal Steam Pod Flat Iron. This iron is amazing for girls like you. Rainy or humid weather is ideal for the appearance of those creepy little hairs. However, exposing the hair to the sun also causes frizz, since the high temperatures tend to dry the hair, causing breakage. Therefore, it is important to protect the hair before exposing it to time. In rainy weather, invest in products that shield your hair against moisture. And on very hot days, pass a product with sun protection. Well-cared hair is hair without frizz, that's fact. So, make hydrations regularly in your hair. The frequency will vary depending on your hair type, and thicker hair with chemical processes should be regularly moisturized. Excessive mask and products that are not suitable for your hair type can increase frizz, so seek to get in touch with people who specialize in the products you use on your hair. Chemical processes such as discoloration, smoothing and etc, damage the hair and generate frizz. Avoid doing these kinds of procedures to the fullest and, if you cannot avoid it, take good care of your hair after the procedure. In addition, it is always important to carry them out with qualified professionals and products, generating as little damage as possible to the hair and thus avoiding the appearance of frizz. 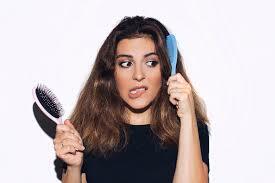 This habit is mainly harmful to women with curly or wavy hair, since when passing a hand on the hair, it loses definition causing the appearance of frizz. Raising a hand in the hair generates friction which also contributes to the appearance of frizz. So think twice before slapping the strings with your hands. If you are adept at white hair, you must have noticed that the frizz are always present in your hair. The reason is because the lack of melanin leaves the hair more fragile, causing dryness and breakage. This is not to say that you have to paint your hair, but you must adopt habits to keep your white hair hydrated, strong and healthy, thus avoiding frizz. Any action that may break the yarn should be avoided and sleep with the hair stuck with elastic causes the break. The friction of the elastic on the pillow makes it easier for the hair to break. Broken hair end up shivering and thus appearing frizz. If you cannot sleep without holding your hair, the tip is to avoid elastics. Sleep with a cap or make a very loose coke. By focusing on these habits and following the tips, the frizz will decrease considerably. However, if it persists there are some easy to do treatments that you can adopt to soften the strands and have your hair aligned. For this you only have to check next. This article is written with the courtesy of https://flatironpoint.com.